Since first reading “The Four Hour Workweek” back in December of 2011, I have been playing with the idea of lifestyle design. If you’re not familiar with this concept, check out Tim Ferriss’ blog at www.fourhourworkweek.com/blog or better yet, start here, http://fourhourworkweek.com/the-truth/ and read through rest of Tim’s resources. Since then, I have had an overflow of ideas from creating information products in the real estate, preparedness and survival, budget travel, martial arts, body re-compesition, the list goes on and on. Until recently, I’ve been mostly scatterbrained and haven’t really followed through on one single product or website until now. A while back I came across a niche website program from Pat Flynn, from www.smartpassiveincome.com called Niche Site Duel. Pat has a number of successful niche websites, and is super transparent on how he takes the site from brainstorming ideas and topics to completed site, and even further into monetization. 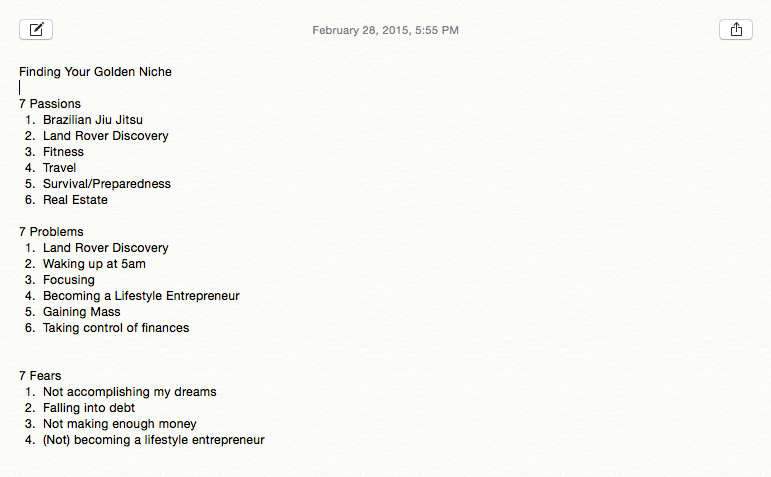 I’ve decided to take the advice of MANY lifestyle entrepreneurs, and focus on just ONE product and service at a time. Even though I would much rather focus on my for sale by owner project, it’s not getting the traffic that initially hoped it would, so I’m going to put all of my energy and free time into building a niche website the right way, using the sessions from Niche Site Duel as the model. While I would love to begin monetizing the site right away, and bring in $2,000-$4000 a month in passive income, my focus is going to be placed on being calculated, making sure that I follow every step of NSD, and the best content possible to rank number one on Google for my target keyword. You should know that I am the furthest thing from an expert at this stuff. I’m documenting this in my blog because I want something to show for all of the hours that I put into this project. I want a place to archive, and search for the steps and actions that I’ve taken, and to serve as a checklist of sorts. If you are looking to build your own niche website, I recommend visiting Pat’s blog at www.smartpassiveincome.com, and following the guides and tutorials that he has over there… Let me get three or four of these under my belt, and then I’ll feel more comfortable slinging out advice. The first thing we need to do before thinking about buying a domain, hosting, finding the right theme and all of that other wantreprenuer stuff is to find the right niche to build the site around. In SPI003 Pat talks with Glen Helsop about finding your Golden Niche and the method of 7x. This takes your through the process of discovering and writing down the 7 things that you are most passionate about, fearful of, and your 7 biggest problems. Two things to note.. One, I couldn’t come up with a total of seven things for problems and fears. Two, I now have even more ideas for niche sites down the road, but I already have a solid target keyword and idea that is currently getting 2400 searches for the exact keyword phrase I’m targeting. Ideally, you want to target a keyword that has over 7,000 monthly searches and low competition, but I wanted to start with something that I have expertise in. This project isn’t so much about the money, as much as it is creating a high quality niche site. I figure even if I generate $500-$1000 a month in Adsense revenue, I have the ability to write an e-book or membership program for additional passive income. The keyword that I am targeting is “freight broker training”. It incorporates my experience and expertise in freight broker sales, an industry that I’ve worked in since 2005. Secondary target keywords are “how to become a freight broker”, “freight broker salary”, and “freight broker academy”. 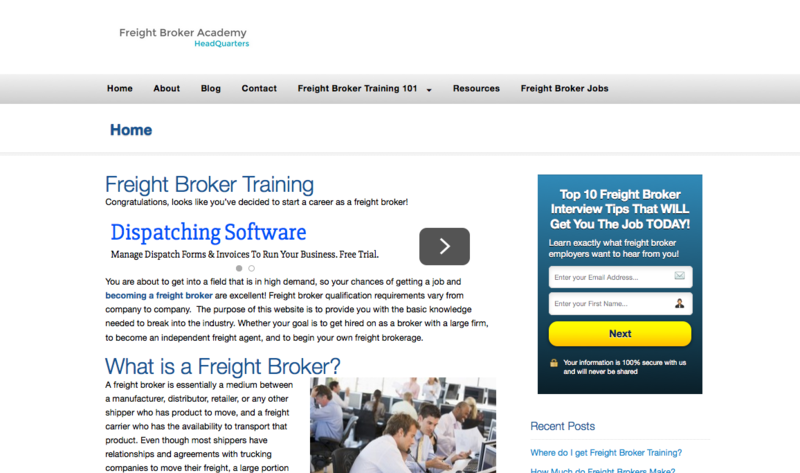 So we’re off and running… Let’s see how fast we can get Freight Broker Academy HQ to rank #1 on Google!